I've been mulling over the idea of using a simple T-shirt as the beginnings of a summer dress. I started off with a small, white vest-top from Primark for a little girl aged 3 - 4 years. It cost me the princely sum of £1.30, and then I used bits of left-over lawn cottons from other projects to make the skirt, which cost me nothing. What do you think of the result? The big idea is that the T-shirt forms the body of the dress. 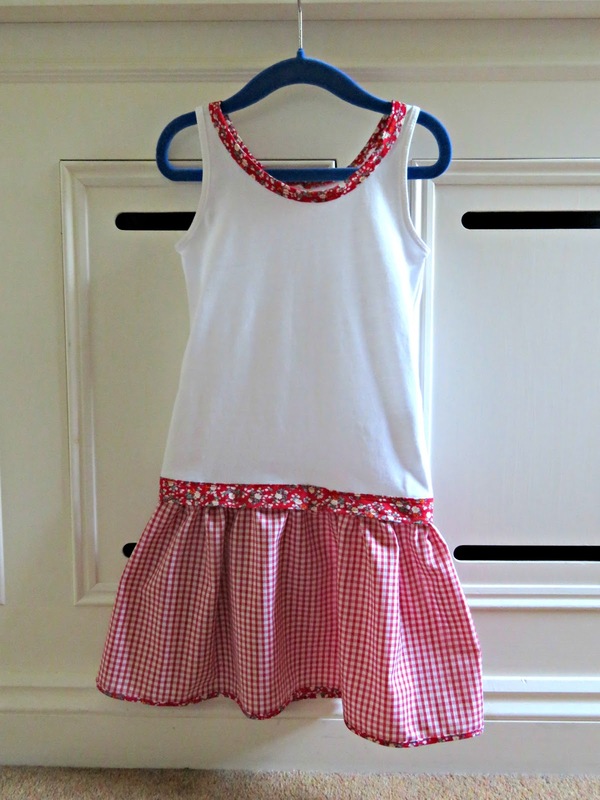 A dropped-waist waistband, which will sit below the child's natural waistline - on her hips, is attached to the double hem along the bottom edge of the T-shirt, to which the flounces of the skirt are then attached. Given that the hips are the widest part of the body, everything above them should fit through as a pull-over dress without the need for zips or buttons for extra wriggle room. 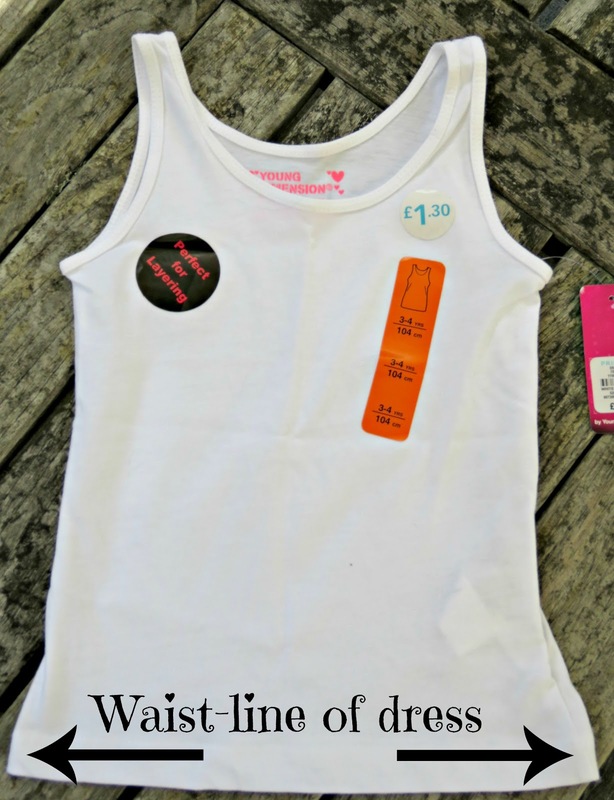 Start off by measuring the width of the shirt along its bottom edge. My T-shirt laid flat measured 29.5 cm from side-seam to side-seam. The finished waistband will have to be twice this width, which in my case meant that it had to have a total girth (all the way around of 59 cm). Allowing a 1.5 cm seam allowance will mean that the width of the waistband that you have to cut out will be 3 cm more than the all-round girth (i.e. 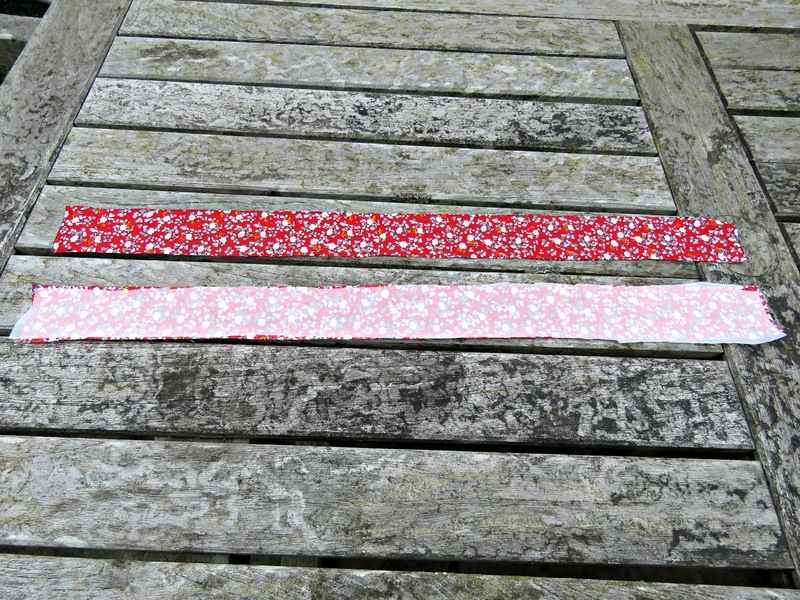 2 seams with combined allowances of 1.5 cm per seam). In my case that makes my cut-out width 62 cm. Along the bottom edge of the T-shirt there's a double turn-up seam. In order to have uniform tension, this seam will form the template for the waistband that is sewn on top of it. The depth of this seam will be the finished depth of the waistband. Add in the 1.5 cm (x2) seam allowance, and you've got the depth of the waistband that you need to cut out. In my case the bottom seam measured 2 cm deep. 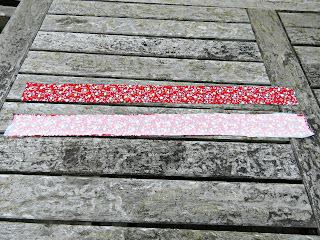 Therefore adding the seam allowance, top and bottom my cut-out had to be 5 cm deep. Using medium weight interfacing, cut out one rectangle of the same dimensions as the waistband, and apply it to the wrong side of one of the waistband sections. Pin the waistband sections together with the right sides facing, and sew around both long sides, and one of the short sides (1.5 cm seam allowance). Trim, and turn so that the right side is showing. I use a pot-stick, pushing on the sewn short edge, to get the long tube to turn so that the right side is on the outside. Press neatly, and pin to the T-shirt following the double seam at the bottom all the way around. Fold in raw edges of the unstitched section, and join the waistband so that it forms a closed circle around the waist. 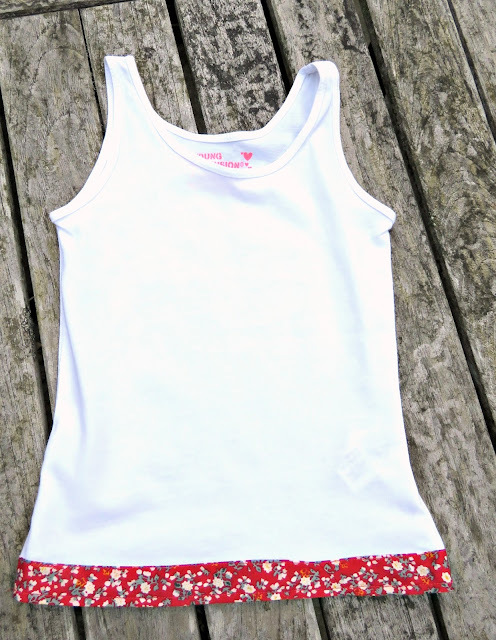 Sew the waistband to the T-shirt along the top and bottom edges, hand-stitching the join so that it forms a neat seam. Cut a frill with the grain of the fabric running length-wise. This frill should be at least twice the girth of the T-shirt. In my case it measured 120 cm around, and was 24 cm long - although you can, of course, cut it to whatever length will suit your child. Along one of the long sides sew two rows of machine stitches about 6mm and 10 mm from the edge using the largest stitch-size that your machine sews. 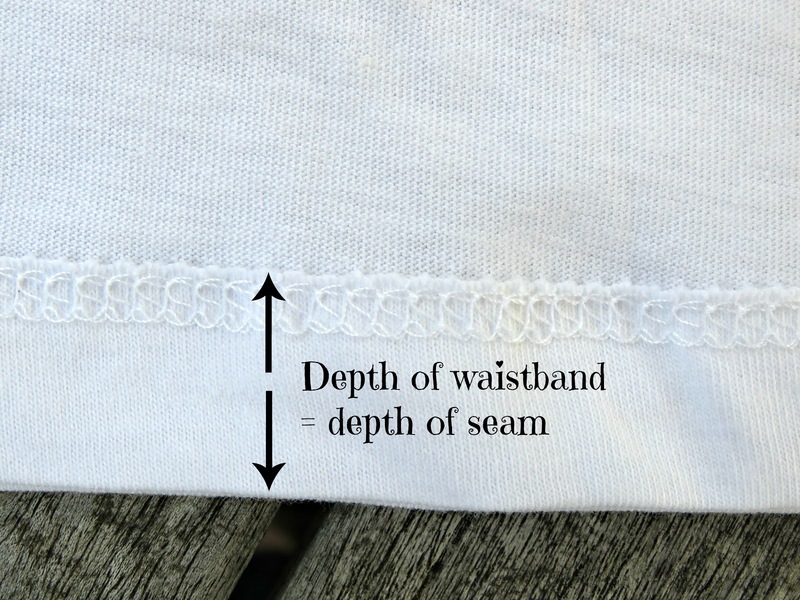 This will help you to gather the frill, creating small gathers along its length so that it can be eased onto the back of the waistband, and sewn in place. 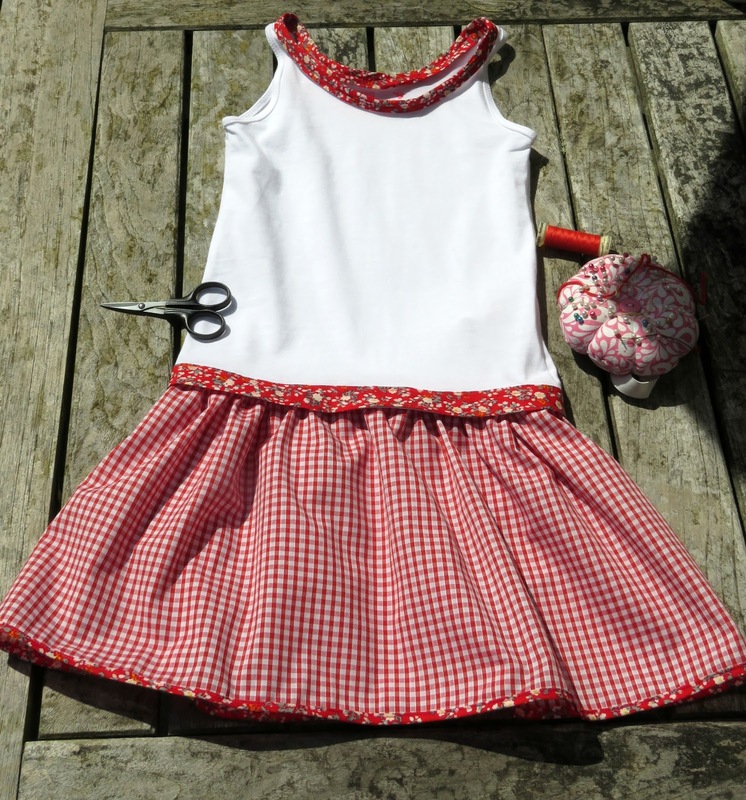 Fold the frill in half, and then in quarters marking out the four equal quarters of the frill with tailor's tacks (sewn loops of thread, snipped through with scissors so that they are straight ends). 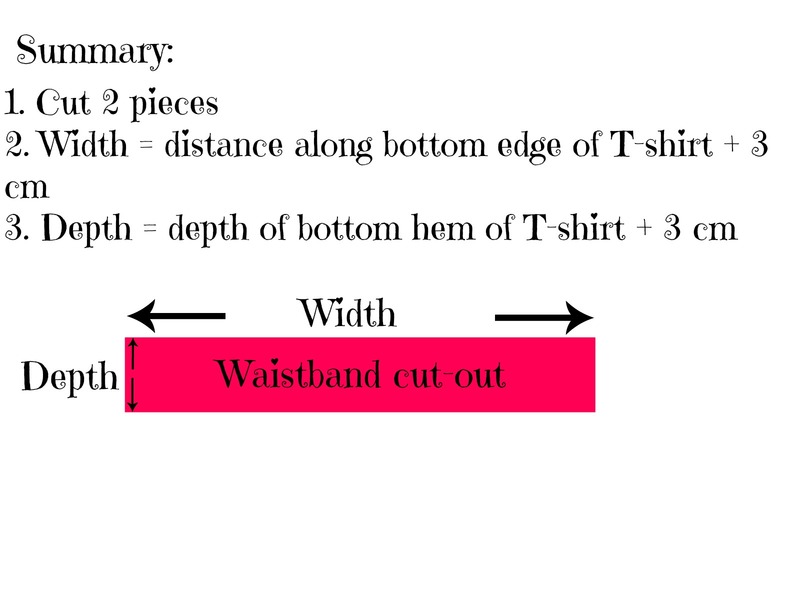 Similarly mark out the four quarter points along the T-shirt waistband with tailor's tacks. Sew the two side edges of the frill together with a 1.5 cm seam, and press flat. Your frill will now form an open-ended cylinder. On the bottom side of the frill finish off the raw edge with a contrasting bias binding, or a simple rolled hem. Using a pin to pull the thread along the double sewing line at the top of the frill, pucker the upper edge, creating gathers until each quarter of the frill fits the corresponding quarter of the T-Shirt hem. Then pin and tack the frill with the right side of the frill facing the wrong side of the waistband, so that it forms a skirt around the bottom of the T-shirt. Check that the skirt will have an even hem, then sew it in place. I had made some bias binding that I'd made earlier with the waistband material so I sewed that around the neckline to complement the waistband. And that was the job done! 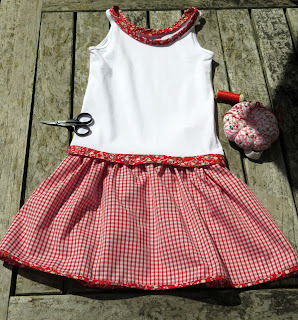 I produced a little girl's dress for well under £2, using bits of left-over fabric. What a great idea. May have to measure and do one for my grand-daughter. So creative you are. :) Love it and thanks for sharing. Thank you, Pea Bea. So glad you like it. I saw this last night, and stopped to hunt a dress I had made Lorelei...Here it is. It is not as nice as yours. I love the little extras you added to yours...specially the bias binding to neck and hem. Rose your dress is gorgeous. Lorelei looks so sweet in it. I love how you've used contrasting materials too. Thanks for sharing it!